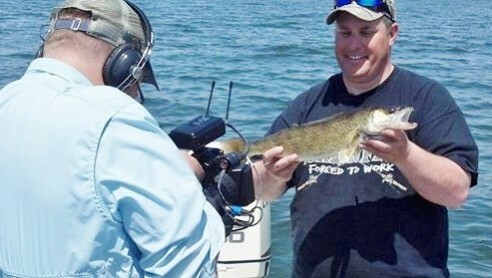 The award-winning Fishing the Midwest Television series announced today that the show’s episode airing the weekend of January 24 and 25 will feature Big Stone Lake. The episode will show spring walleye fishing and then conclude with an ice fishing segment featuring the lake’s jumbo perch. The show will air in the Big Stone Lake area on Fox Sports North at 11 am on Saturday, January 24. “We hi-lite top fishing destinations across the Midwest on Fishing the Midwest and Big Stone is certainly that!” stated Mike Frisch, co-host of the show. “We had some awesome open-water fishing for walleyes of all sizes and, the winter perch fishing was really good too,” Frisch went on. “Artie Arndt of Artie’s Bait and Tackle was our guide for the show and he did an awesome job putting us on the fish,” Frisch concluded. 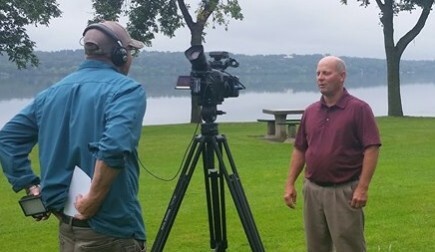 “In addition to hi-lighting Big Stone’s terrific fishing opportunities, we were also able to give our viewers solid information on the entire Big Stone area and some ideas regarding lodging and dining for anglers traveling to Ortonville and the surrounding area,” Bob Jensen, Fishing the Midwest’s founder added. “We have been to Big Stone several times and the lake never disappoints!” Jensen concluded.